Each company has had recent troubles, of course. We’ve seen Facebook stumble through its IPO, Twitter anger its developer partners as it shifts its focus inward, and LinkedIn struggle with an embarrassing data breach in June. In spite of these issues, conventional wisdom says that if you draw enough eyeballs, the ads will come. That’s the way it’s supposed to work, but for LinkedIn, display ads would be awkward. After all, do you want an advertisement for some product you don’t endorse next to your professional profile? For Twitter, it’s a case of real estate. How can you display an ad next to a 140-character statement? It would be intrusive. The key for Twitter it seems is to get people to come to the Website, yet many people access it through an application like TweetDeck or a mobile device. As much as Twitter has tried to lure people to Twitter.com, I don’t think that is how most people use the service. What’s more, Twitter has tried to package Tweets from celebrities or events into destination sites, such as its agreement with NBC to build a Twitter destination page for the Olympics. While both sides said it was a success, it was an extremely bumpy ride, as many tweeters complained about the coverage and #nbcfail was a popular hashtag — not exactly what NBC was hoping for when it signed the deal. Then there is Facebook, which has learned to use advertising to some extent — although the display algorithm only works with moderate degrees of success and sometimes produces comical results. What’s more, the IPO that was supposed to be a huge payday has turned embarrassing, as the stock price never really took off and has yet to recover. All three services struggle with mobile, where advertising on a small screen becomes an even bigger challenge. Maybe they are looking at this the wrong way. Perhaps advertising is not where the money is. While it has catapulted Google to great riches, the social sites have not been able to repeat Google’s success. Perhaps the money lies not in serving targeted ads, but in making better use of the data. As we have seen on Facebook, for example, in spite of their geek pedigree, the ads still often miss the mark badly. But Twitter, Facebook, and LinkedIn are all sitting on huge amounts of valuable data. If they could find ways to tap into that data and make it accessible for researchers, marketers, and other interested parties, it could be the key to finding the true value of these sites. And before you start complaining about the privacy implications of this type of arrangement, it could be done in a way without revealing personal information about individuals, but with data in aggregate. What do all males under 25 post about most often? (Okay, perhaps there’s a less obvious example.) But all joking aside, the value of these companies is in figuring out how to harness all of the data and create tools to make it useful. 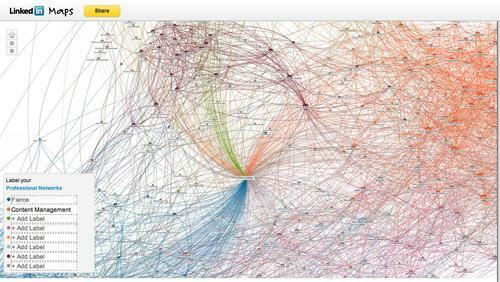 Ron Miller’s professional network, with his contacts sorted by color. This is one small example of how to transform the data inside one of these social networks and visualize it in an interesting and somewhat useful way. Surely, these are first-step experimental attempts at exploiting this data, but in the end, the company that finds a way to package and present the data in simple ways is going to be the one that makes the most money. That’s because I believe the power of these services is not in the number of users, or in delivering the most ads, but in harnessing the data they generate — and surely there is money in all that data.